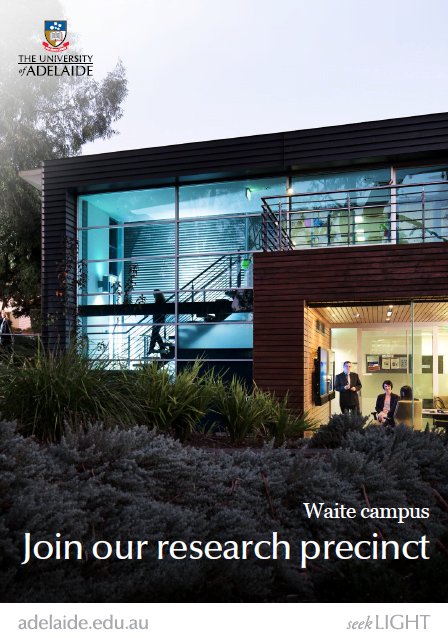 The Waite partnership features a rich network of collaborations across the Campus arising from the close co-location of several complementary organisations. Often housed within the same buildings, scientists and researchers from separate organisations work side by side. This enables cooperation, sharing of resources and synergies that would otherwise be difficult to achieve. The partnership also facilitates co-supervision and industry placements for postgraduate students, joint applications demonstrating critical mass for funding of step change agricultural research programs and recruitment of promising graduates to work in breeding programs. The Wine Innovation Cluster (WIC), a partnership of the four Waite organisations involved in wine and grape research, is one of the more formal ongoing collaborative initiatives that has emerged from the co-location model. Comprising 62% of Australia’s capability in this area, the WIC was established to enhance coordination and integration of grape and wine R&D on the Waite Campus, and aspires to address the sector’s long-term challenges in a systematic and proactive way. The WIC has worked on 35 funded joint projects, worth a total of $27.6m, during the past five years, including a $2.4m ARC Industrial Transformation Training Centre for Innovative Wine Production which involves all four partners. The WIC aims to boost the competitiveness, quality and sustainability of the Australian wine industry through world-class, collaborative, multi-disciplinary research and development across the wine value chain. More finite and targeted collaborations include innumerable joint research projects in areas such as viticulture, food and nutrition, plant breeding, wine science, entomology, plant pathology, soil contamination, plant physiology, food safety, agronomy, farming systems and natural resource management. The pooling of knowledge and resources that occurs on a daily basis at the Waite is an important factor in enhancing successful outcomes and generating a more holistic approach to solving problems, but also reducing duplication and waste in R&D.